This piece of writing developed out of an email to Charles Sharpe of the goodenoughcaring.com journal who was reviewing my book Social Care and Child Welfare in Ireland: Integrating Residential Care, Leaving Care and Aftercare – http://www.goodenoughcaring.com/the-journal/review-social-care-and-child-welfare-in-ireland-integrating-residential-care-leaving-care-and-after-care/. In this email, I sought to explain to Charles the reason why I choose a verse of poetry for the dedications page of the book. Charles kindly published the original piece of this work, titled The Stolen Child, at http://www.goodenoughcaring.com/the-journal/the-stolen-child/. However, as I find often happens, this piece of writing provoked further reflection on my part and this spurred me to further explore some of the issues I addressed in the original piece of writing as many of these issues, such as the entire domain of poetry, were areas I had little previous experience or knowledge of. This curiosity then led me to continue to develop the original Stolen Child article and what follows is a direct continuation of the original piece. I am conscious that this is a form of reflective writing recording my evolving thinking on matters contained within the text and therefore is subject, as indeed its very nature demands it, to change. Were it not so there would be little point in my continued research after all, and history tells me I will likely continue. I believe the reification of that fabled state labelled ‘objectivity’ has the potential to lead to the compartmentalisation (or suppression) of bonafide emotional responses and a denial of the reality that hurt can be a price of caring just as pain can be a price of love, as I found out with the loss of my father. Such prejudice favours those who may have no or limited experience of caring or who have practice experience but can no longer tolerate the emotional cost of caring. In a Bourdieusian context the question is are those who write the rules for, or referee or teach, ‘the game’ (the field of social care/work) predominately those who are no longer capable of the feelings that afford ‘a feel for the game’ and if this is the case is the game rigged to validate and align with their agendas (via the prejudicial reproduction of specific habitus by practitioners) which reinforce their capitals, at the expense of authentic relational caring? Could it be that there is a connection here between the demotion of the relevance of feelings and emotions with the apparent ambivalence with regard to child and adolescent mental health issues exhibited by many professionals? Sometimes it is as fundamental as right and wrong and our feelings and emotional responses can play a key role in assisting with the differentiation of this distinction (Fenton, 2015). These feelings and emotions can also inform other critical distinctions such as between instinct and intuition where in my experience intuition has proven to be far more trustworthy and contextually valid than instinct. Supposed facts and evidence have a propensity to change over time, their interpretation being influenced by new knowledge as in the case of DNA evidence in criminal proceedings where executed convicts have been exonerated posthumously. When it comes to the social professions the paramountcy of context must always be acknowledged and context is, after all, ever changing. Then there are those times when the penny drops and we see the facts that have been staring us in the face, hidden as Holohan (2011) put it ‘In Plain Sight’, but we had failed to recognise. Therefore, with regard to facts and evidence, there are always unknown facts that may become known at an unknown time as highlighted by Donald Rumsfeld when he said: ‘there are known knowns, know unknowns and unknown unknowns’. This, of course, means that our factual knowledge is incomplete and ever-changing and therefore relying solely on, alleged, facts and evidence to determine approaches, and eligibility, to care is patently flawed. Yes, feelings can and frequently do change, as it must be noted does context, yet we must also acknowledge that some feelings such as the bonds of affection often last, unchanged, a lifetime. We would do well to acknowledge the importance currently being accorded to Emotional Intelligence/Competence within many professions where Emotional Competence is increasingly valued above Intelligence Quotient (IQ). Paradoxically, in a profession founded on relationships, social care/work, the techno-rationale remains privileged despite the recognition afforded to the importance of Emotional Competence (Howe, 2008). Rather than seeing emotions as solely clouding judgement emotional competence validates the inclusion of information derived from emotions into decisions making processes as a valuable means of informing such process. In the social professions, scientific approaches amenable to quantification remain reified partly based on the false premise that they are unchanging and allegedly devoid of bias when clearly this is not the case in either regard given the paramountcy of context and the fact that the dismissal of feelings and emotions is itself a bias. Furthermore, whilst essential for the expression of empathy with another human being there are also the actions that these feelings and emotions may inspire that must be appreciated. Here, it is not the feelings or emotions themselves that are the most important factor, it is actions that count. But, if we deny the feelings and emotions in the first instance then we also deny the potential for the sorely needed actions they may prompt. I believe that the lack of recognition for the importance of feelings and emotions also tends to pathologise the righteous place of passion in social care (Trevithick, 2014) and I am proud to say I love my profession. I also believe that the role of feelings and emotions (and intuition), as well as that of dialogue within the process of turning theory into practice (praxis) requires re-evaluation and re-positioning within the hierarchy of relevance in the social professions. Whilst acknowledging that the word trauma is increasingly being used to describe an ever-widening array of events, circumstances and conditions in the 21st century, as are the words therapeutic and resilience, nonetheless it is true to say that we have all experienced varying degrees of trauma, for example, we have all experienced bereavement and loss, and each of us deals with these traumas differently. There are those professionals who maintain that all trauma can be processed into something else, perhaps a benign memory or some other construct couched in euphemistic terminology, that need no longer causes emotional distress or unduly influence our thinking. This, I suspect, may afford a sense of (professional) superiority by affording the person the veneer of being uninfluenced by emotional responses and therefore of being ‘objective’. However, this can also place unrealistic expectations, and therefore feelings of failure and weakness, on many who are struggling with such loss and other forms of trauma just as the obsession with resilience in social care/work can cause similar negative experiences for those who fail to exhibit the desired outcomes attributed to resilient people. I wonder if neo-liberalism has merely re-framed this concept, a concept which I accept does exist but not in this form, to further its pernicious and procrustean agendas? Here, this neo-liberally defined form of resilience is seen as a potential antibiotic or super-drug aimed at dealing with the symptoms of the underlying diseases thereby diverting attention from where it is most needed i.e. dealing with the actual diseases of neglect, poverty, social exclusion, abuse and community deprivation (Fenton, 2014). Neo-liberalism presents parallels with Darwinism but with a hyper-acceleration of processes analogous to those Darwin theorised. Here, it is the survival of the fittest (financially), the winners or ‘the deserving’, to the detriment of the less fortunate, the losers or ‘the undeserving’, with the markets (the mother (nature)) nurturing the former at the expense of the latter. This is the most artificial form of unnatural selection. But is this a society we would wish for our children? I see resilience all around me in the children and young people I meet both in care and after they have left care. They have experienced the worst of adverse childhood events yet they strive to overcome these and in my experience most often want no more than to grow into independent and happy adults no different than others in society. The very society that has allowed these traumas to befall them in the first place and may also be intolerant of them as children in care. Yes, some days some they may struggle with this but I am always mindful of just what they are dealing with and am inspired by their resilience. They, and others like them, are to me what true resilience is. To revert back to these processes of addressing trauma, what is notably absent from these processes of addressing trauma is compassion, both in how we approach and understand others and also ourselves (Neff, 2015). Yes, we must understand our reactions and responses to the pain of others and ensure we recognise and differentiate our needs from the others’ needs, but then these needs, need not be mutually exclusively met. Some of the best social care workers I have worked with over the years have managed to skillfully and appropriately combine both and in this process develop meaningful relationships with difficult to reach young people. Here critical (self) reflection and an appreciation of the potential for processes of transference and counter-transference are critical with personal therapeutic process, at times, necessary on the part of the professional. However, whilst addressing such personal dynamics is essential it is important to recognise that often there is no quick fix, despite the promises of some therapies, and sometimes the best that can be achieved is to learn to understand and live with, to accommodate, these feelings and emotions. Time is also essential, though of itself time does not heal. Time affords the opportunity for the acquisition of positive experiences of what works for the individual, as well as that which doesn’t. Time then allows the space for the re-authoring of internalised blueprints for how the inner self relates and responds to the external world, thus enabling change to permeate through all levels of consciousness. Just as courage is not contingent on the absence of fear so recovery is not contingent on the absence of pain or emotional distress. Rather, it is the recovery of the ability to live life fully and authentically by experiencing the complete spectrum of human feelings and emotions including love and joy as well as pain. Yes, in many cases recovery can include the transformation of painful memories into less painful or traumatic memories which do not evoke the same emotional responses and possibly flooding as previously but recovery can also be appropriately seen to be founded on the ability to regulate rather than transform or eliminate painful memories and emotions. Such as perspective is advocated by researchers, most notably Calhoun & Tedeschi, who have identified a potential outcome to trauma(s) they have termed Post Traumatic Growth. This, they posit, is the experience of positive growth that individuals experience as a result of their struggle with a trauma event. The paradox here is that the individual is rendered more vulnerable, yet stronger. In reality, they are more resilient having grown from the traumatic experience and no longer live in fear of bad things happening to them, as bad things have happened to them and they have survived. They have become, partially at least, inoculated against the fear of risk so pervasive in this century’s society as posited by the like of the sociologists Ulrich Beck and Frank Furedi. This then poses the question of whether this is not resilience by another name? and if it is then this clearly reinforces the previously made point that it is Emotional Intelligence rather than Intellectual Quotient that can be most beneficial to human functioning in today’s complex interconnected world particularly with regard to the development of personal resilience (Van Rooy and Viswesvaran 2004; Schneider et al., 2013). The acceptance of vulnerability, together with embracing risk, trusting feelings, the avoidance of assumptions and pre-judgment as well as being open to new experiences constitute the characteristics which Carl Rogers (1965) identified as being present in a ‘the fully functioning person’. Trauma can cause us to seek to avoid the re-experiencing of pain associated with the traumatic experience but this can be at the cost of experiencing joy in our lives. Many traumas occur within our relationships with other people and therefore it can be our current relationships which are negatively impacted by such traumas and in reality, it is these very current relationships which offer us the most viable pathways to recovery. Yeats portrays that the allure of escape from a ‘world more full of weeping’ can precipitate becoming stolen from this world and all its everyday and ordinary experiences, ‘the lowing of the calves on the warm hillside’, and these experiences are often where joy and meaning are to be found. The significance Yeats attaches to nature and the simple things in life is a theme running through much his poetry and perhaps a reason for its widespread popularity as it connects the reader to that most powerful human collective and universal condition, the experiencing and re-experiencing of feelings and emotions, especially those most-meaningful feelings and emotions associated with childhood. For my part, I find that when I stop and take in the beauty of nature I am removed from my troubles and connected to a world much greater than myself. That most beautiful wildness that is all around me in the landscape of Ireland and I am then often reminded that this is the landscape that my ancestors beheld and my children and their children will behold, it was here before me and will be here after I am gone. I am but passing through and am truly privileged to live in such a beautiful place and, for however flayed we Irish may be this is ‘our’ flaw, part of what Yeats termed our ‘indomitable Irishery’, and I am proud to say that I love my country. Being mindful of this I am then reminded how fortunate I am to be surrounded by love in my life; love of my work, love of where I live and the love of my family. Realising this I may then appreciate just how privileged I am to be able through my work to try to make a difference for hurt children and young people who may be struggling to build such lives, just as I struggled following the death of my father and the perceived loss of his love. Then, of course, I lose this connection, succumbing to the inescapable human developmental condition whereby that which is extraordinary becomes rendered ordinary and I again become caught up in the day-to-day struggles of work and life. But then (mother) nature is, like Winnicott’s ‘good-enough parent’, most often there when needed. With regard to the importance of pain to human development, I must state that I derive little or no pleasure or comfort from pain. However, I recognise the existential importance of pain, not the least due to recognising that the experiencing of painful feelings such as guilt as being essential for healthy moral and social development and functioning. Also, within the context of this consideration of childhood and adolescence, it must be recognised that one of the core tasks of adolescence is the struggle with unconsciously dealing with the painful existential injustices of life. Injustices such as the inevitability of death or the absence of guarantees in life which generate an angst, further fuelled by the increasing awareness of the fallibility of adults with the recognition that one’s parents have ‘feet of clay’ and cannot shield the adolescent from the mortality of life and the reality that ultimately life is often not fair. The previously-noted certitude of adolescence is likely linked to this recognition of the fallibility of adults but this certitude is doomed to be short-lived as the adolescent emerges into adulthood and whilst taking on the robes of responsibility of adulthood also takes on the fallibility previously identified in adults. The certitude lives, much like a caterpillar, within the all too brief window of transition between adolescence and adulthood, which although protracting in recent decades (Arnett, 2007) remains a short life-stage in terms of duration comparative to adulthood. Whilst recognising that adolescence angst does indeed exist such a conception of adolescence also challenges the commonly held view of adolescence as a time of storm and upheaval as the certitude acts to counter-balance the angst. Perhaps this is its purpose and if so it ought well to be embraced by parent and carers for its critical role rather than dismissed as it often may be, as immature and naive arrogance. Consequently, I accept that pain, in all its forms, is something that must be accepted rather than denied if we are to grow to our fullest potential as human beings. As Jung said: ‘there is no coming to consciousness other than through pain’. Balance is the key. So now I shall address my newfound interest in the poetry of Yeats and its relevance to the practice of social care. I believe Yeats’s poetry evidences the universality and endurance across time of the experiencing of feelings and emotions, what in academic terminology is termed the reliability, generalisability and replicability of research together with another bastion of academic discipline, academic rigour, evidenced in the linguistic structure of his work. His poetry is, after all, a form of research into the lived human experience composed 130 years ago yet still as relevant today as when he composed it. The more I learn through life experience and academic endeavours the more I see the truth espoused by Yeats, perhaps Ireland’s foremost poet, and Einstein, perhaps the world’s foremost scientist. Yeats, for his line in the Stolen Child that there is more to this world than we can understand and Einstein who said ‘the more I learn the more I realise I don’t know’. Here, I find truth as these two positions unite the artistic and creative aspects of being human with the scientific domain thereby affording an epistemological common ground. But I am not the first to make such connections. There exists a significant body of literature linking Yeats’s interest in the supernatural or magic, to Jung’s science of psychology (Hollis, 2005; Olney, 1992; Snow, 2014). This body of literature identifies how they explored convergent themes in their work with, in some instances, Yeats first identifying topics which Jung later developed, though through a common interest and perhaps synchronicity rather than imitation on Jung’s part (Yeats, 1901). This then builds on the oft-cited cliché that ‘magic begat science’, where chemistry is identified as coming from alchemy, astronomy from astrology and engineering from a desire to control nature by knowing her ways. Coupled with this, if we consider the significance of the use of language in psychology, academia and research the question then arises as to what scope may exist for poetry to broaden existing qualitative research methodologies as it has broadened the field of personal therapy with the addition of poetic therapy? We are after all human, not omniscient, beings (though with the potential for magic which perhaps we call resilience (Masten, 2015). In fact, many notable figures have written of magic with regard to psychology and social care, including Sigmund Freud (1939) and Thom Garfat (2003). Could it be that adults and we social care practitioners are first and foremost adult human beings, are seeking magic in our lives? Perhaps we are seeking to re-connect with the lost enchantment of childhood where faery tales were our source of meaning-making, hope and inspiration in a world full of wonderment (Bettleheim, 1975). If the practice of social care, where the relationship acts as a catalyst to transform hurt and alienation into recovery and connection, is a form of art rather than formulaically-prescribed actions on the part of the worker, as I believe it to be, then is this not the seeking of magic? For, what is art, the communication of alternate interpretations (meanings) induced by the manipulation of people, words, symbols and images, if not a form of magic? And is this meaning individually-ascribed by each observer or participant not but an impact on the consciousness of that person? This, then means that art and magic are both processes that endeavour to alter human consciousness (change thinking and awareness) and in this process facilitate the transcendence of personal experience. For my part, I do believe in magic, I do I do, to paraphrase Tinkerbell from Peter Pan. I have witnessed magic happen many times in social care, and I have been fortunate enough to have been an actor within some small number of these occasions where children and young people have overcome apparently intractable adversity and transformed into healthy and happy people through the power of relationship with supportive adults and sometimes aided by their peers. The relationship is the magical fabric of social care. A fabric woven with flexible yet unbreakable threads of acceptance, compassion, empathy, understanding, affinity, respect, kindness, strength, belonging, courage, transcendence, tolerance, faith, inspiration, love, forgiveness, belief, listening, empowerment, partnership, determination, support, growth, patience, fun, collaboration, potential, healing and teaching. A fabric so powerful that it can contain the otherwise unbearable and boundless pain and distress that these children and young people have experienced. A fabric woven with individual threads the whole of which is far greater than the sum of their individual parts. This magic of relationship cannot be conjured on command and we may not always recognise its magnitude whilst experiencing it yet when we are aware we are in its presence we can harness its transformational power. Thereafter, it is another of its magic properties that without having any longer to be in its presence we can continue to benefit from its power and better replicate the process of its creation. It is invisible, unquantifiable and powerful largely beyond my comprehension, yet, thankfully, I have felt something of its power in both my personal and professional life (Fenton, 2014). I believe that the fallacy of the positivistic approach with its ‘appliance of science’ methodologies is the belief that everything in this world can be understood and accounted for and therefore, by extension, controlled, which is in reality but another form of illusionary magic (Stivers, 1999). I also recognise that my lived experience is my truth and not everyone else’s. But then, and as previously highlighted, we know that via processes such as globalisation that the 21st-century individual, Yeats’s human child, is more and more becoming connected by the strands of the increasingly digitised global webs of human connectivity. Webs that bind us all in an increasingly interdependent state; it is no longer uncommon to read in the media or literature that ‘the local is global and the individual is universal’. Yet this universality pre-dates mere technological developments achieved in the 20th or early 21st century as evidenced within the concept of the ‘collective consciousness’ first theorised by Emile Durkheim in the 19th century and Jung’s concept of the ‘collective unconscious’ both of which infer a binding of all human beings as a collective entity. Perhaps Yeats’s faeries are a representation of the collective unconsciousness of the Irish people made conscious, as Jung theorised, through dreams, feelings and intuition and then recorded and communicated via poetry and storytelling in the quest to give meaning to nature. Jung asserted that the human psyche is constituted of four basic functions: intuition, thinking, feeling and (physical) sensation and he, and Carl Rogers amongst others placed great emphasis on intuition, which he defined as ‘perception via the unconscious’. The recognition of the role of the unconscious has always been central to the psychodynamic approach and notably in recent times the significance of the unconscious has been making somewhat of a resurgence in the social professions and the human sciences. This resurgence is being supported by, inter alia, recent neuroscientific advancements which demonstrate that, at most, merely 20% of our brain is engaged with conscious processes leaving the remaining 80% involved in what can then only be sub- or unconscious processes. With the rapid development of communications and social media in the 21st century coupled with the equally rapidly advancing mergence of human biology with technology with, for example, biological computing one has to wonder are we witnessing the emergence of a new form of collective consciousness, a next generation collective consciousness where our individual neural pathways are becoming globally interconnected via digital pathways, and if so what might this mean for the evolution of the human species? With regard to the role of the unconscious in caring for adolescents, it must be acknowledged that the struggle to navigate permissiveness and control is another core challenge and one requiring an appreciation of the power dynamics at play. It is my belief, based on my practice experience, that control within residential care for adolescents is largely an illusion, and the higher up the management ladder one goes the more illusionary it becomes. Once we accept this and cease trying to achieve control through coercion or reward we become liberated to achieve what in fact we are seeking, a healthy environment where children’s needs are therapeutically met by staff whose wellbeing is valued and promoted. By giving away ‘control’ to both staff and young people through empowering and then motivating them, congruence is enhanced. People will, given the right resources within the right circumstances, most often choose to do the right thing and this is true of residential care services too. Thus, by not seeking to control others we are less likely to need to exercise control and this is the great paradox of our current risk management and control hegemonies: by seeking to control that which we would do better not to seek to control we actually diminish what we are seeking. If we do not meet the needs of adolescents for autonomy and self-determination by empowering them with age-appropriate levels of agency they will either comply with our directives under duress and therefore not internalise the changes we are seeking to teach/impose or they will reject our authority and through their assertive and non-compliant behaviour take the legitimate sense of agency they seek. If neither of these scenarios unfolds then there is the potential for them to seek to have these needs met elsewhere which can expose them to a host of harms which we, the professionals, can do little to ameliorate as we have lost their trust and with this any possibility to meaningfully engage with and support them. If we are to achieve positive outcomes for children in care we are better employed to embrace risk and relinquish control within risk-tolerant relational approaches to care that promote the agency and internal locus-of-control of the staff and young people. However, all our interventions with children and young people must fit within the framework of their evolving capacities (Lansdown, 2005) and this must also include acknowledging the need for intervention in the event of temporally diminishing capacities. We must be brave enough to embrace risk beyond our current thresholds but also brave enough to be decisive when, and only when, absolutely needed. I have learnt that control, like love, we must brave enough to largely give away in order to regain, but then, this is not so surprising as both involve caring. Mentoring has proven to be highly effective in engaging and sustaining relationships with adolescents, largely I believe, as the altered power differential made possible between mentor and mentee as opposed to that between professional social care worker (the expert) and client/service user/young person (the novice) ‘taps into the very essence of the adolescent process, with the unconscious struggle between authoritarian and anti-authoritarian parts of the maturing self’ (Obholzer and Roberts, 1994:133). Thus, it is apparent that the unconscious plays a central role in human development and therefore in social care. It is also apparent that Yeats, the poet, and Jung, the scientist, were converging in their investigations on realms beyond consciousness and matters that may not ‘meet the eye’. This is not as surprising as it may at first appear when we consider that the scientific research method is itself based on abductive, inductive and deductive reasoning two of which processes are predicated on the hypothesising of the un-provable, or put another way that which ‘does not meet the eye’. Inductive reasoning, based on employing data revealed by observation, patterns and current knowledge, determine conclusions, known as conjecture and deemed to be probable rather than provable, whilst abductive reasoning may be said to provide the best explanation to what is otherwise unprovable. “There is no logical way to the discovery of these elemental laws. There is only the way of intuition, which is helped by a feeling for the order lying beyond the appearance”. So now it feels like time to bring to a conclusion what appears to have developed into an exposition of some of my core beliefs, curiosities, and life experiences. 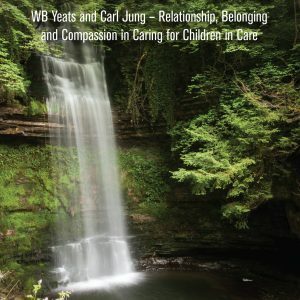 The ‘evidence’ of my lived experience has taught me that my capacity to embrace my vulnerability is one of my most valuable assets in my practice as a social care professional and, somewhat counter-intuitively, I have come to recognise that what I had been socialised to regard as a weakness, vulnerability, has in fact often been both my most protective factor and greatest strength. We all have different motivations for why we entered social care work and why so many leave and so few of us remain over the course of our working lives. It is certainly a most rewarding yet also demanding career. It is actions like writing this book and professional activism with other like-minded professionals coupled with a belief that it is better to try and fail than to fail to try, that are part of my self-care management in this ongoing process of advocating for and with those people who state care has carelessly left, labelled by ignorance and assumption, their distress and pain condoned by indifference. “understanding the relationships between the personal and the political will contribute to your courage as will inspiration drawn from others including clients who acted rather than remained passive in the face of injustice”.